Synopsis : RightHear system provides sight impaired full access and orientation in public buildings with real-time voice cues via smartphone about their indoor location. RightHear, a developer of advanced solutions for the blind and visually impaired, today announced the US launch of its first-of-its-kind system, making public buildings fully accessible to people with sight impairments. RightHear addresses the accessibility, orientation and navigation needs of blind and visually impaired persons (as well as orientation challenged individuals), providing them with real-time voice cues, through their own smartphone, about their precise indoor location, directing them and narrating the surroundings around them. The voice notifications are based on information received from Bluetooth beacons (sensors) located in the building. The sensors are installed by the building staff, by simply attaching them to the wall with a sticker. The sensors' location is determined in consultation with RightHear. In addition, the system includes an administrator dashboard, allowing the building staff to program and control the whole system optimally, according to the needs of blind and visually impaired visitors and employees. The RightHear system is suitable for any type of public building, including complex buildings (interconnected buildings) such as malls, corporations, universities, municipalities, airports, museums, supermarkets, hotels and restaurants. The smartphone app alerts users whenever they are near a RightHear-enabled building, and picks up the signals automatically from the beacons. The user is notified when a new local RightHear-enabled accessible zone joins the RightHear network. 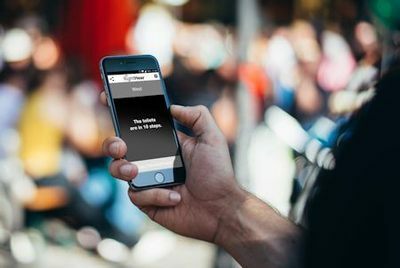 The RightHear application on the user's smartphone can also instantly translate the text and read it aloud in the user's preferred language. "Using RightHear, blind and visually impaired persons have full access and full orientation in public buildings, giving them the ability to be independent," said Idan Meir, RightHear's CEO. "On the other hand, public venues and facilities will benefit from increased numbers of visitors, including blind and visually impaired persons, that until now had difficulty visiting these places." The RightHear system has already been deployed in hundreds of buildings and complexes, mainly in Israel. RightHear is currently represented in the US by Deon Bradley in Florida (Tel: (704) 604 8244) and the system is also distributed by Woodlake Technologies in Chicago (Tel: (312) 733 9800). The solution can also be ordered through support@right-hear.com. Founded in 2015, RightHear develops advanced orientation and navigation solutions for the blind and visually impaired. The first system serves users for indoor navigation and orientation, and comprises Bluetooth beacons (sensors), smartphone application and administrator's dashboard. To date, the RightHear has been installed in over 600 venues, mainly in Israel, including malls, corporations, universities, municipalities, airports, museums, supermarkets, hotels and restaurants. The RightHear smartphone app is available for free download on both Android and iOS, and can immediately connect with RightHear Bluetooth beacons. *News Release by RightHear: Disabled World makes no warranties or representations in connection therewith. PR content may be edited for style, clarity, and/or length. If you are connected with this page and want it corrected/updated please contact us.